With the Easter holiday coming up we got to thinking about how many great egg-related designs there are out there. From products for eggs to ones shaped like eggs, these pieces are so eggciting that you wouldn't even dream of hiding them. An Easter backdrop with all eight glossy colors of the Egg Birdhouse by designer Jim Schatz would make for a great backyard party. Perfect for storing or serving eggs, this ceramic egg-crate holds a dozen eggs at a time. Crafted from ceramic with a brilliant red finish, this egg holder is a stylish way to serve up deviled eggs on any occasion... but we think they taste better after an hour or so spent finding them in the yard. With their geometric design and pale turquoise hue, these little egg cups from Burkedecor by Ferm Living make a pretty addition to your Easter brunch table. Donna Wilson's latest collaboration with Rococo Chocolates: a series of six hand-painted easter eggs made of white chocolate layered on top of dark chocolate. Peep-induced sugar rush? Good thing these felted-wool egg cozies from Parkhaus Berlin are keeping your hard boiled eggs warm for when you need a break from the sweet things. Just make sure no one slipped a Cadbury's Creme variety under there, or you might be buzzing on through next Easter. 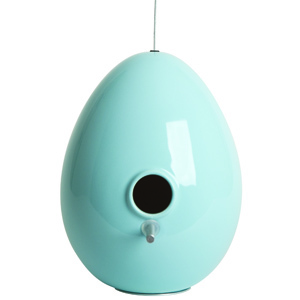 This outdoor lamp by Archivio Storico for FontanaArte brings new meaning to hiding eggs in the backyard. It's like Easter for adults—only these glowing orbs won't be hard to find and there is most cetainly no candy inside them. This three-legged standing Birdhouse consists of the egg, hand-milled from solid walnut or teak and the steel legs, offered in a raw burnished finish as well as several standard powder coat colors. This beautiful piece can be displayed as art indoors just as easily as a working birdhouse outdoors. OK, OK, we know these aren't egg-related but we couldn't help it. There's something about an adorable bunny that still pulls at the old Easter Sunday heartstrings. These 100% organic cotton plush rabbits are just too darn cute, and would make a perfect companion to a spring day spent eating peeps, jellybeans, and chocolate.